Kelsea Ballerini joined Maren Morris and Carrie Underwood on the red carpet for the 2018 CMT Artists of The Year event on Wednesday (October 17) in Nashville, Tennessee. 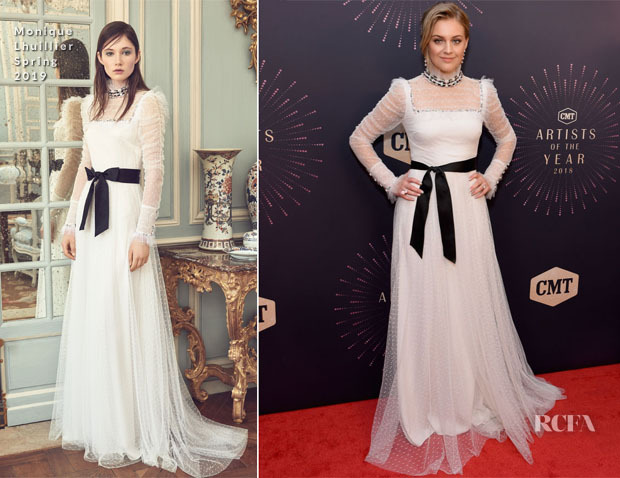 I was surprised to see the young singer wearing this Monique Lhuillier Spring 2019 gown, as her red carpet style usually has a more youthful, edgy flare. Just look at her American Music Awards look for reference. As beautiful as this gown is, I don’t think it, especially with that high neckline, is working for her.